You could be wondering what is so special about React; What we will do is pick up from a previous post about React components and put to practice the theories we discussed following community best practices as always. 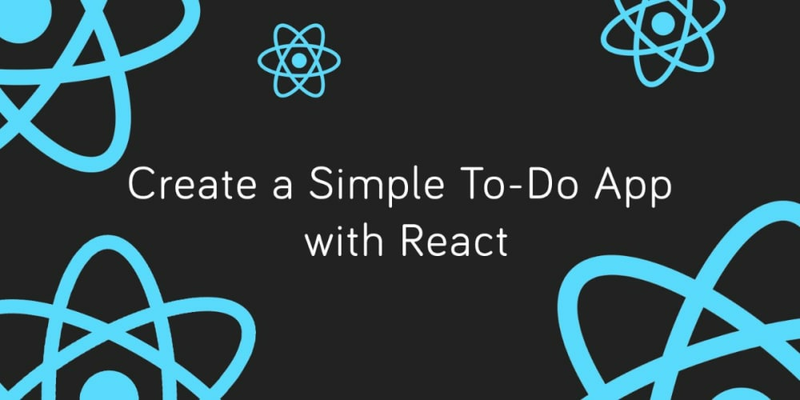 As the topic implies, we are going to be building a To-Do application with React. Do not expect any surprises such as managing state with a state management library like Flux or Redux. I promise it will strictly be React. Maybe in following articles we can employ something like Redux but we want to focus on React and make sure everybody is good with React itself. ReactDOM is a standalone library that is used to render React components on the DOM. Presentation Component: These are contained components that are responsible for UI. They are composed with JSX and rendered using the render method. The key rule about this type of component is that they are stateless meaning that no state of any sort is needed in such components. Data is kept in sync using props. If all that a presentation component does is render HTML based on props, then you can use stateless function to define the component rather than classes. Container Component: This type of component complements presentation component by providing states. It&apos;s always the guy at the top of the family tree, making sure that data is coordinated. It is a recommended practice to have a rough visual representation of what you are about to build. This practice is becomes very important when it comes to component-based designs because it is easier to recognize presentation components. Your image must not be a clean sketch made with a sketch app. It can just be a pencil work. The most important thing is that you have a visual representation of the task at hand. Functional components (a.k.a stateless components) are good for presentation components because they are simple to manage and reason about when compared with class components. Functional components just receive props (which we destructured with ES6) as arguments and return JSX to be rendered. TodoForm has just one prop which is a handler that handles the click event for adding a new todo. The value of the input is passed to the input member variable using React&apos;s ref. See the Pen AXNJpJ by Chris Nwamba (@christiannwamba) on CodePen. The remove property is an event handler that will be called when the list item is clicked. The idea is to delete an item when it is clicked. This will be taken care of in the container component. The only way the remove property can be passed to it&apos;s to the Todo component is via it&apos;s parent (not grand-parent). For this sake, in as much as the container component that will own TodoList should handle item removal, we still have to pass down the handler from grand-parent to grand-child through the parent. This is a common challenge that you will encounter in a nested component when building React applications. If the nesting is going to be deep, it is advised you use container components to split the hierarchy. This will eventually become the heart of this application by regulating props and managing state among the presentation components. We already have a form and a list that are independent on each other but we need to do some tying together where needed. We first setup the component&apos;s constructor by passing props to the parent class and setting the initial state of our application. Next we create handlers for adding and removing todo which the events are fired in TodoForm component and Todo component respectively. setState method is used to update the application state at any point. As usual, we render the JSX passing in our props which will be received by the the child components. The first argument is the component to be rendered and the second argument is the DOM element to render on. We could step up our game by working with a HTTP server rather than just a simple local array. We do not have to bear the weight of jQuery to make HTTP request, rather we can make use of a smaller library like Axios. React lifecycle methods help you hook into React process and perform some actions. An example is doing something once a component is ready. This is done in the componentDidMount lifecycle method. Lifecycle methods are just like normal class methods and cannot be used in a stateless component. See the Pen PzVyRm by Chris Nwamba (@christiannwamba) on CodePen. We violated minor best practices for brevity but most importantly, you get the idea of how to build a React app following community recommended patterns. As I mentioned earlier, you don&apos;t need to use a state management library in React applications if your application is simpler. Anytime you have doubt if you need them or not, then you don&apos;t need them. (YAGNI). On the other hand, expect an article on Redux from Scotch soon.